AT Internet helps you to extract immediate value from your data using its unified digital analytics platform, the Analytics Suite. 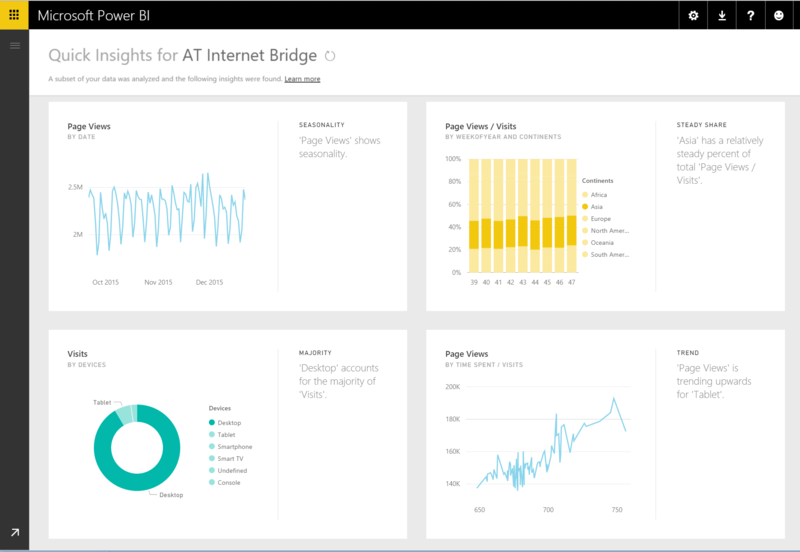 The AT Internet Bridge content pack for Power BI includes data around visits, sources, localization and devices for your site for the last 3 months. This initial version of the content pack allows you to visualize all your AT Internet analytics data in a standard dashboard and customize your reporting to get meaningful information at a glance. 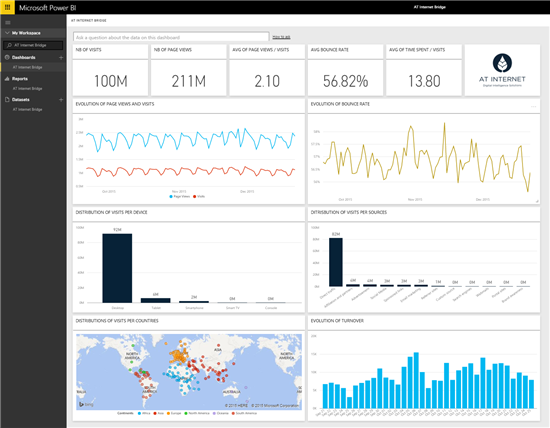 This post will provide an overview on how the Power BI content pack helps users explore and monitor AT Internet data. For additional details on how to get started, please see the our help page. Start loading the content pack by specifying your website number and your AT Internet account in Power BI (basic authentication). Once the content pack is loaded, you’ll see a new dashboard, report and dataset in your workspace. Clicking on the tiles will drill into the reports built on top of the data set. Select the “Distribution of visits per countries” map chart to drill into the “Countries” report. You can hover over any of the visualizations to see additional details about that specific data point. Selecting any of the values will cross filter the other visualizations, and you can use the slice in the top left to view a subset of the data by data source. Selecting “edit report” wiill list all of the tables and fields that are included in the dataset. This mode allows you to add filters, create or modify visualizations and add new report pages. You can also try getting Quick Insights for your AT Internet data set as described in our previous blog post. This feature will analyze your data for correlations, trends, outliers and more. Select the menu next to the data set and choose the “Quick Insights” option. Once ready, you can view the insights that were discovered and can easily add them to your dashboard. Any of the visualizations be pinned back to the dashboard to further customize it. When you pin a visual you’re prompted to choose which dashboard to pin to, allowing you to build up a dashboard with tiles from multiple different reports. After you initially import the data, the dashboard, reports and data set will continue to update daily. Select Schedule Refresh on the data set to customize and control the refresh schedule. 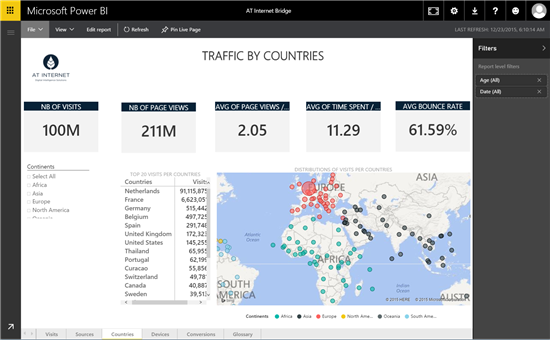 The AT Internet content pack for Power BI helps you visualize and explore an initial set of metrics and reports that can be customized for your scenario.